In September the Clifton Down team completed a Marathon walk of 26.2 miles starting from Clifton Down Shopping Centre, Bristol and finishing at The Shires Shopping Centre, Trowbridge. The purpose of the walk was to continue in the Clifton Down Shopping Centre’s support for the great work achieved by the local Bristol Charity, Above and Beyond. During 2016 the funds raised will be focused on the charities Dementia Project, and help fund the much needed reminiscence pods, and other tools to aid the care of dementia patients. All money raised will fund a reminiscence pod for Above and Beyond. To date the Shopping Centre has raised over £6,000, during three years of support. In 2016 the Shopping Centre team are aiming to reach the £10,000 milestone for the local charity. 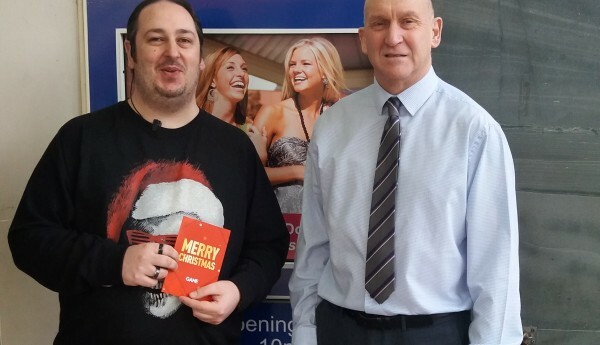 Pictured above is Shaun Goulding, Security officer at Clifton Down receiving a gift voucher from David Gowen-Porter, Operations Manager to acknowledge Shaun’s achievement in completing this selfless and painful act for such a good cause. Well Done Shaun and to all of those that took part!